I got one of those promoted Instagram posts a couple of days ago, Colbie Caillat announcing her new single 'Goldmine' from her upcoming album, The Malibu Sessions. Caillat became a phenomenon after her pop-catchy Bubbly received a gazillion hits on YouTube back in 2007. The California girl shot to fame while I was still working my old steady freelance gig at 805 Living magazine out in Westlake Village, California and the editor asked me to interview her for our back-of-the-book feature, PS. The singer, born in Malibu, was raised in Newbury Park and went to area schools in Thousand Oaks. As was often the case, we didn't meet, I interviewed her over the phone. I won't pretend to know her. It's not as though I was able to trail after her for a week, like the Rolling Stone journalist in Almost Famous, observing her in action. We didn't keep in touch. If I got an invite to go see her perform, I didn't accept it. I didn't tag along with the photographer Gary Moss on the shoot. 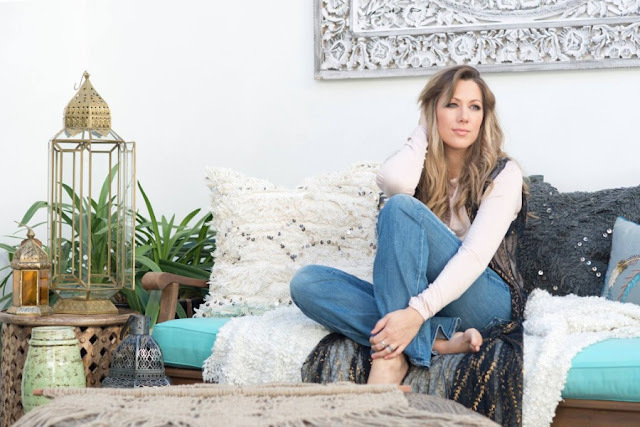 I had little choice but to accept what Colbie told me about herself at face value. Even over the phone though, the husky voiced singer's sweet and bubbly nature shone through. While she told me her mantra was “Be happy and treat everybody kindly, the way you want to be treated’’ she wasn't saccharine, rather she was mellow, 'chill' as you whippersnappers would say. She reminded me of the beachy hippie chicks I used to go to school with in Santa Monica back when the 60's became the 70's. I suppose that makes sense, going to high school back in the day, the Malibu kids took the school bus down the Pacific Coast Highway from Trancas and Zuma to join us on the Samohi campus. 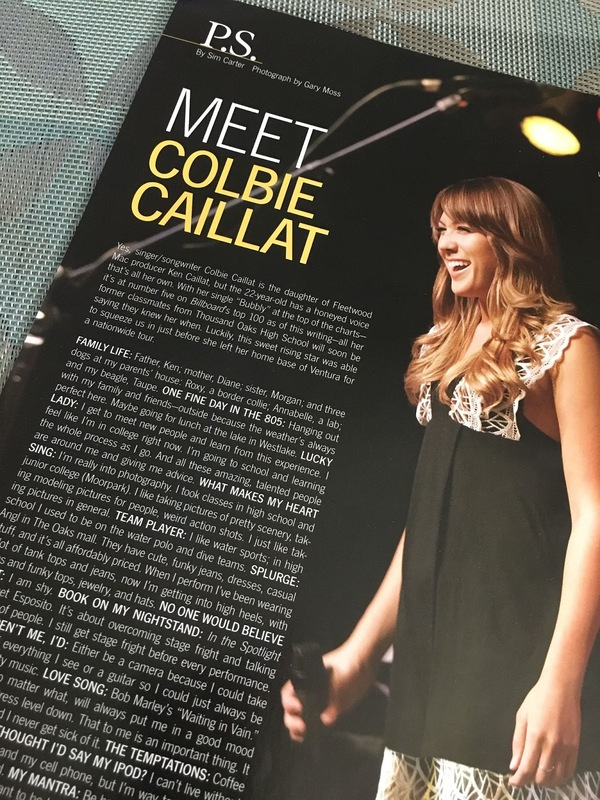 Colbie was twenty-two, and no stranger to the biz. Her dad is Ken Caillat, the Fleetwood Mac producer, so she knew how the industry could waft you high up in the air and just as suddenly let you fall from space. I spoke with her as she was on the verge of departing for her first national tour, asked her my usual questions: what's your idea of the best day ever, what book are you currently reading, what's your guilty pleasure, what would you be if you couldn't be ‘either a camera so I could take pictures of everything I see or a guitar so I could always just be making pretty music’. Not a think piece in any way, it's the kind of stuff that can be whipped up into little puffy phrases, perfect for browsing at the end of the magazine. That 22 year old girl is now a 31 year old woman and I wonder if she still gets stage fright. She probably does, plenty of stage actors and performers do: Laurence Olivier, Ella Fitzgerald, Adele. Barbara Streisand's stage fright kept her from touring for three decades. Happily, Colbie seems to have found a way to manage hers. You're right. Same sound. Bet many of the people you interviewed faded into the woodwork. I'm going to have to look back and see! I remember interviewing Jonathan Lipnicki, the cute kid from jerry Maguire He was on a local high school's waterpolo team, he may have quit the biz altogether.